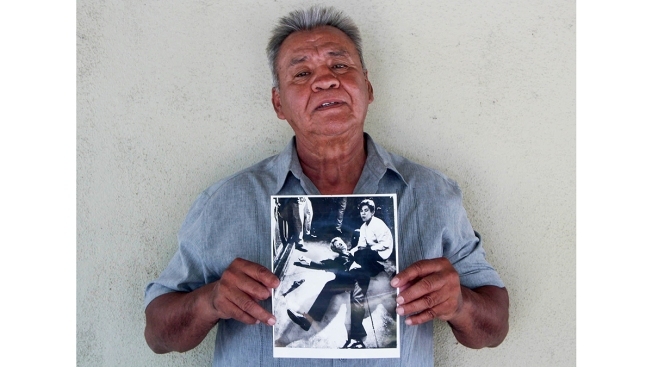 Juan Romero, 67, holds a photo of himself and the dying Sen. Robert F. Kennedy at the Ambassador Hotel in Los Angeles, taken by the Los Angeles Times' Boris Yaro on June 5, 1968, at his home in Modesto, California. Juan Romero was a teenage Mexican immigrant working as a hotel busboy 50 years ago when he was thrust into one of the seminal moments of the decade. Romero had just stopped to shake the hand of Robert F. Kennedy on the night of his victory in the California presidential primary on June 5, 1968 when a gunman shot the New York senator in the head. Romero held a wounded Kennedy as he lay on the ground, struggling to keep the senator's bleeding head from hitting the cold floor of the Ambassador Hotel kitchen. For almost a half-century, Romero blamed himself, wondering if he could have done more and often asked, what if Kennedy hadn't stopped for that brief moment to shake my hand? The torment ate at Romero so much he fled Los Angeles and resettled in seclusion in Wyoming. Today, nearly 50 years after that tragic early morning, the 67-year-old Romero doesn't bear the same guilt, thanks in part to the support of RFK fans who say the former busboy was an example of the type of people Kennedy sought to help in making racial equality and civil rights a cornerstone of his life's work. Romero grants few interviews but recently made himself available for the Netflix documentary "Bobby Kennedy for President," StoryCorps and others to talk about the hope RFK inspired that remains with him 50 years later. "I still have the fire burning inside of me," Romero told The Associated Press. But Romero's stepfather "ruled with an iron hand," and the teen feared he'd face trouble at home if he took part. Instead, Romero got a job at the Ambassador Hotel as a dishwasher and later a busboy. At the time, the young Romero didn't understand politics. Yet he knew that President John F. Kennedy had traveled to Mexico and saw footage of Robert Kennedy visiting Mexican-American farm workers in California. When Robert Kennedy announced he would run for president, Romero got caught up in the excitement. "When I listened to Robert Kennedy, I felt he wasn't talking at us, but talking to you personally," Romero said. "All I remember was that I kept staring at him with my mouth open," Romero said. Kennedy grabbed Romero's hand with both hands and said, "thank you." For a moment, there was silence. The busboy walked out of Kennedy's room with complete happiness. Nothing would stop him from pursuing his dreams, Romero felt. "Now, they call it swagger," he said. "I had no doubt that I had just met the next president of the United States." "Is everybody OK?" Kennedy asked. Yes, he said. "Everything will be OK," Kennedy said before losing consciousness. Romero put a rosary in Kennedy's hand. Wife Ethel Kennedy — at the time pregnant with their 11th child — ran to her injured husband and pushed Romero away. Romero turned and saw a group of men punching the gunman. "I felt my hand making a fist to join in," Romero said. "Then I thought, what's the point?" Dawn Porter, who directed "Bobby Kennedy for President," said it was an honor to speak to Romero and allow him to share his story for the Netflix documentary. He opened up upon meeting Kennedy aide Paul Schrade, who was wounded in the attack, for the first time in decades. The two shared their emotional memories. "We just pointed the camera and let the two of them talk," Porter said. "It was powerful." He's still angry that Kennedy never had the opportunity to lead the fractured nation and tackle poverty and discrimination. "People often say I was at the right place at the right time." Romero said. Then after a long moment of silence said, "No, the right place at the right time would have been me ... taking that bullet."